Mom was okay when I accepted the gracious invitation to join friends in St. Augustine for my birthday and Connie’s 90th. How could I have known that she’d take a turn for the worse two weeks before I left? I agonized over leaving, but she and my siblings insisted I go. The truth was, she had been closer to death several times before. I recalled my desperation 13 years earlier when a quadruple bypass left her on the brink for days. “Please! I’m not ready to lose her!” My prayer was answered. The glue they used on her bursting artery worked, and she lived. But 9 years later, with pneumonia and her heart condition, she refused treatment and convinced us all that she was truly ready to join Dad in heaven. We respected her wishes, but it was still not her time. She was disappointed when she graduated from hospice. Now, 4 years later, having dementia added to the burden of pain, she was desperate to leave. We understood, and made sure her doctors and nurses were prepared to keep her comfortable, but forgo any efforts to extend her life. But when I got off the plane into Florida’s green January, it felt like stepping into another dimension, and I knew I’d made the right decision. Maybe it would even make it easier for Mom to leave this earth, without me and my tears there holding her back. When I spoke to her on the phone, her voice was weak, but she was happy that I was there in the warm sun. I looked for the feather under the pole, but with the wind madly shifting directions, who knew where it might have landed? As I searched, picturing the feather being blown from the bird, I suddenly remembered what had happened 11 days earlier. I was walking down by the Minnesota River when a young bald eagle flew over me. 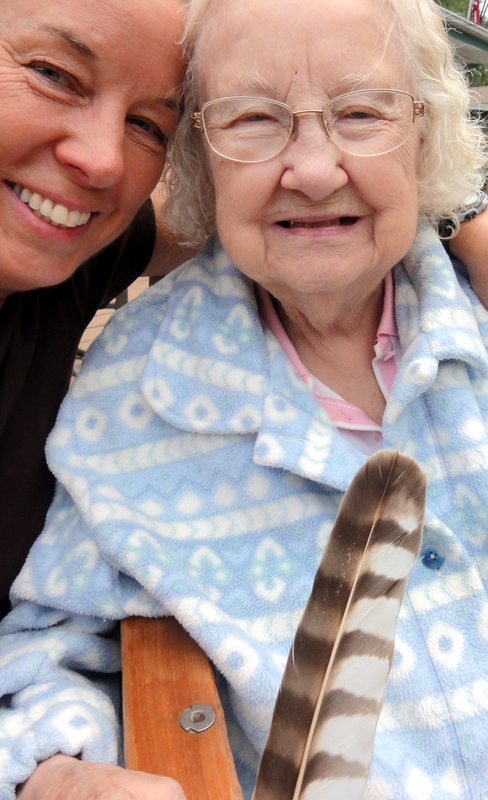 I always loved sharing my sightings with Mom, so I stopped at her nursing home and told her, adding that Native Americans say the eagle is blessing you when it flies over. She shared my excitement, as always. Then I asked her, “When you’re an angel, will you fly over me and bring me a blessing?” She beamed and said “Yes, I will!” I told her to drop a feather so I’d know it was her. My heart skipped a beat. Was that osprey sent by Mom to bless me? Had she finally gotten her wish? Was she an angel? Now I had to find the feather. I searched earnestly, almost desperately. Finally, there it was, lying on the sand, making me softly gasp when it came into view, more beautiful than I expected with its distinctive, gently curving dark and light stripes. My eyes welled with gratitude as I reached down, picked it up, and kissed it. 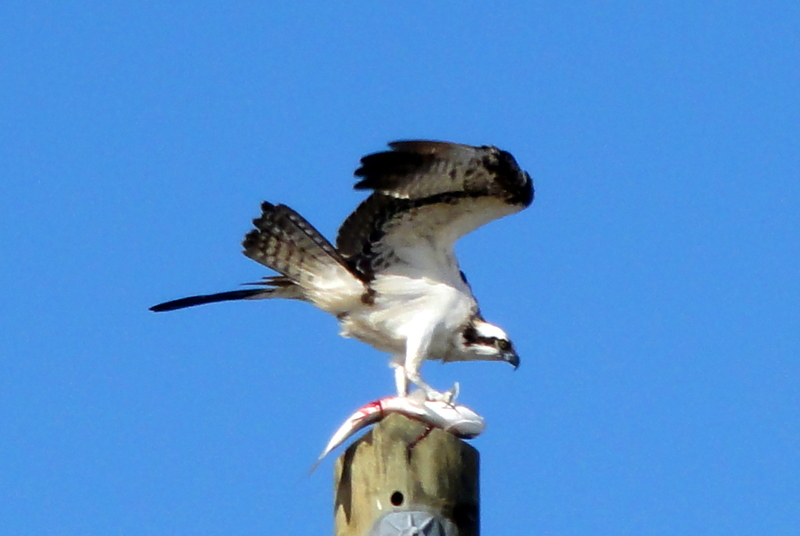 As I walked slowly back toward the beach, the osprey came back and circled over me. “Thank you!” I whispered up to him. I walked back down the beach, wondering if Mom had died. But the sand was radiant and the breeze cool, and somehow, I didn’t feel sad or afraid. We had our lunch and took pictures, and Connie opened her cards. While others said their good-byes, I slipped outside and called my brother James. “Did Mom die this morning?” Silence. “You’re supposed to be on vacation. I’m not supposed to tell you… but she’s having lunch with Teresa, so no, I’m sure I’d have heard if she died.” We laughed. I told him what had happened, and asked him to tell Mom about the osprey dropping a feather, and that I was waiting for hers. He said it would be an eagle when it was Mom. So Mom didn’t get her wish. But I did get a blessing. Now, when I think of Mom dying, I’m not as afraid. I see her free as a bird – that majestic bird – and just as beautiful and powerful. Pain-free and happy. And I know, whether or not she drops me a feather, that she will continue to bless me. For she gave me care and lessons and memories and love that will stay with me every day of my life, until I get to be a bird and fly away to join her.